She’d played with the ukulele since a conference she’d attended in 2004, but it wasn’t until Kate and her husband – luthier Fred Casey – attended the Aloha Music Camp in Kona, Hawaii in 2009 that Kate truly fell in love with the little instrument. Since then she has attended two AMCs in Hawaii, taken instruction from Mark Nelson, James Hill and Raiatea Helm, is Vice Pres. 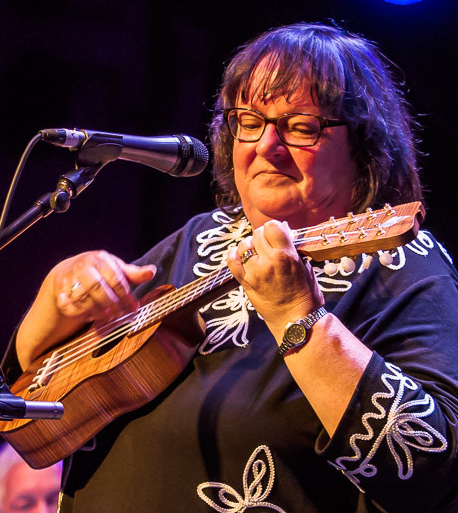 of the Winnipeg Ukulele Club,has written songs for ukulele, developed an Ukulele program for the Winnipeg Folk Festival’s Folk School from 2012 to 2018, has been the Director for the Winnipeg Arts Council’s Ukulele Mass Appeal events, and given ukulele workshops across the province. In fact, she’s been known to sit playing her uke in her car as it goes through the carwash! She can’t wait to share her love of the mighty ukulele with you! After teaching Elementary Music for 11 years, Kate quit to pursue her dream of performing and has been chasing that dream across Canada ever since, as a solo artist and in groups such as folk trio Small Rooms, Canadian Content Theatre Co. and The Blarney Band. She has appeared on TV, Radio and assorted recordings, has been guest storyteller with the Winnipeg Symphony Orchestra, and performed at many Children’s and Folk Festivals, including – of course – the Winnipeg Folk Festival. In 2015 she released her CD “Marie’s Forest”, and in 2017 released “Prairie Girl’s Song”, an illustrated book of one of her songs.